YWCA NorthEastern NY participated in the 2018 Allstate Foundation’s Purple Purse Challenge. We look forward to taking part in the 2019 challenge. Please check back in September 2019 for more information about this year’s Purple Purse Challenge. Please check back in September 2019 for further information. Click to read about some success stories from YES! Why the Purple Purse Challenge? Financial literacy, education and tools are a core need for victims of domestic violence to leave their abuser and remain free from dependence on them. Imagine being dependent on someone else for your well-being, not because you can’t work but because your partner harasses you at work and gets you fired. Perhaps you work, but your partner takes your money and gives you an allowance which isn’t even enough to get your essential needs or to fill the cupboards. You feel shame and embarrassed to ask for more because your partner makes you feel like you don’t know how to manage money. By donating right now, you will help women get the financial services they need to feel confident that they too can live a financially sustainable life independent from their abuser. 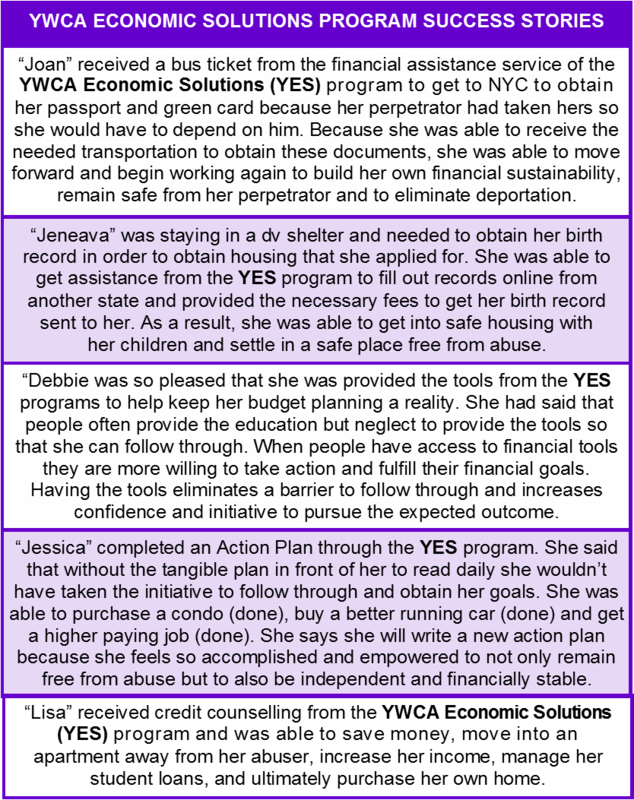 Click the image to the right to read about true success stories from the YWCA Economic Solutions (YES) program. Check back in September/October 2019 for ways that you can help!